Anthony Starego, an 18-year-old placekicker with autism for Brick (N.J.) Township High School, was denied an extra year of eligibility by the state athletic association after his parents had petitioned by saying football greatly helps him manage his condition. 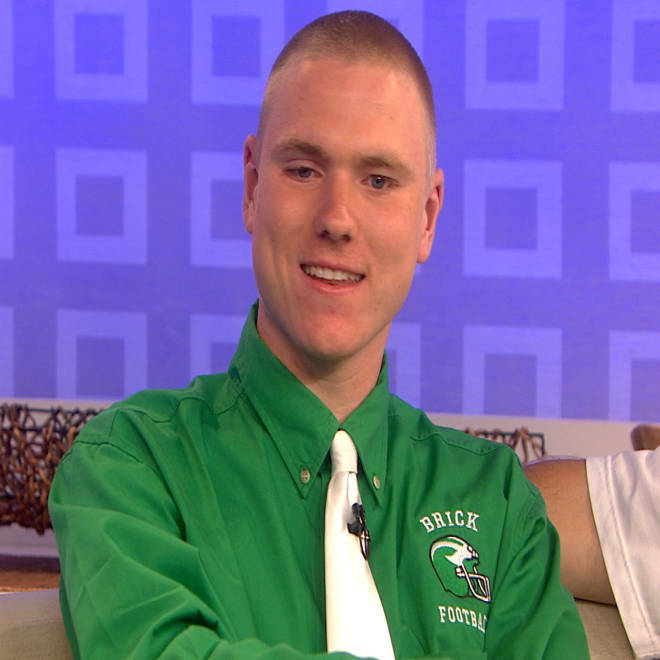 A New Jersey high school placekicker with autism who made national headlines with a game-winning field goal in October has been denied an extra year of eligibility by his state's athletic association. The parents of high school senior Anthony Starego had appealed to the New Jersey State Interscholastic Athletic Association to allow their son to play football for a fifth season because they believe the game has helped him improve tremendously with his condition, and also has allowed him to serve as an inspiration to other athletes with autism. Starego will be attending special classes at Brick until he is 21 years old, according to his father. In what may be a first for an autistic high school athlete in America, Starego’s talent was cited as one of the reasons why he was denied the extra season. Essentially, he is such a good kicker that allowing him to play another year would give his team an advantage over opponents, according to the NJSIAA. Usually, athletes on Starego’s level of the autism spectrum see scant playing time or get inserted in games when the outcome is not in doubt. “This young man brings a high degree of skill to the game,” NJSIAA executive director Steve Timko said in a statement. “He is a physically mature young man with college-level kicking skills. He is a strong competitor and a difference-maker. His participation gives the school an advantage against other teams. “In the end, the committee determined that, among other things, the student did not qualify for a waiver because he has already played four years, he's a difference-maker on the field, and would displace another student on the team." Starego, who appeared on TODAY in October with his parents after his game-winning kick for Brick Township High School, has already used the maximum of eight semesters of eligibility allowed by the NJSIAA and will turn 19 before the fall, making him too old to play under existing rules. The NJSIAA eligibility committee ruled unanimously against his appeal on Wednesday. Starego’s parents are dismayed by the decision. “There's this whole movement in this country saying we need to make high school athletics more accessible to kids who have special needs, but what this ruling says is that doesn't mean anything at all,” Ray Starego, Anthony's father, told TODAY.com. “They need to get on the ball a little bit and start to change these things. The Staregos plan on appealing the ruling to the New Jersey Department of Education, which has the power to overrule the NJSIAA. Anthony took the news hard on Wednesday after his father told him the association’s decision. With just 21 seconds to go, senior kicker Anthony Starego made the ultimate play of his high school football career, kicking a 22-yard field goal to beat the heavy favorite rival school. Anthony and his parents, Ray and Reylene, talk about that amazing moment. Starego did not become Brick’s starting kicker on the varsity team until the sixth game of last season after playing three years on the sub-varsity level. He received national acclaim after booting a 22-yard field goal on his first varsity attempt with 21 seconds left in the game to give Brick a 24-21 upset over Toms River High School North on Oct. 19. He also went 4-for-4 on extra points that proved to be crucial in a 28-27 win over Toms River High School East a week earlier. The committee voted against giving Starego an extra season after hearing a presentation in which Ray Starego presented letters and testimony on Anthony's behalf from 15 NFL kickers, a representative of Autism Speaks, Rutgers University athletic director Tim Pernetti, and the ESPN producer who did a feature on Anthony during the fall. “In this particular instance, the committee struggled with this case because the student is such a compelling young man,” Timko said in his NJSIAA statement. “The voting members, all educators, firmly grasp the sensitivity of this case. It is clear this young man has achieved an enormous amount, and he, his parents, his teachers and his school should all be proud of his accomplishments.